I know, the most famous great equalizers are death and taxes, but let’s not be gruesome. It’s still summer, after all. No, I’m talking ice cream. Ice cream may be the one thing everyone can agree on. Amazing, really, how all demographics love it—babies, old-timers, thirty-somethings. Even those with strict dietary restrictions still eat it, whether they really ought to or not. One 4th of July I witnessed a group of heart transplant patients downing bowls of the highest-fat, homemade stuff, their mates watching, lips pursed, tut-tutting at them. But the spouses didn’t stop them. Maybe it was because they understood that, like it or not, ice cream is something everyone actually needs once in a while. Let’s face it—no eats ice cream because they’re hungry. So why do we eat it? Why do we crave it, body and soul? I think a combination of factors are in play: it’s cooling (lovely in the summertime); it’s sweet (a rare find in nature); it’s full of fat (again, rare in nature) which makes it feel luxurious and indulgent (and who doesn’t like to feel special?). When I was a kid, I went through ice-cream phases in which I got the same thing every time for weeks on end. First it was brown bonnet cones, soft vanilla ice cream quickly enshrouded in chocolate goo, which solidified to a candy shell on contact. Then it was soft vanilla in a cup topped with Bing cherries. During my overweight/painfully self-conscious teen years, it was Carvel’s Thinny-Thin. As unsatisfying as it sounds, but better than nothing. At the Beach Plum, where they made their ice cream on site, I got Straw Cheese (strawberry cheesecake) or blueberry, which had fresh blueberries mixed with vanilla ice cream. Incredible. 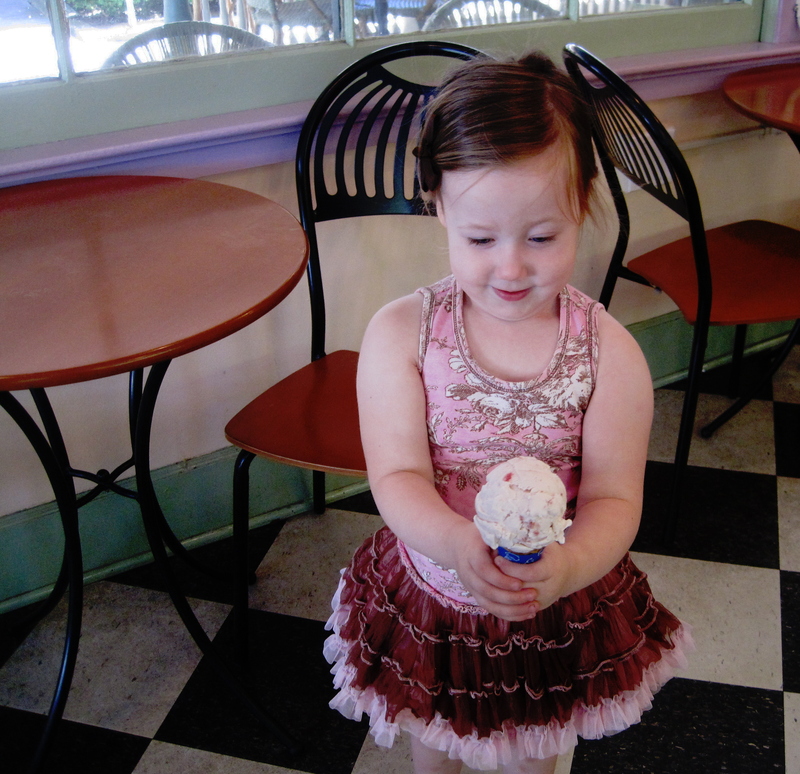 Last week my friend Lauren and the cuties above and below joined me for ice cream at Days in Ocean Grove. For years now this has been my favorite place to get ice cream, for the yummy stuff itself and for the entire experience. Shane and Finley, with post-ice cream happy faces and sticky hands. 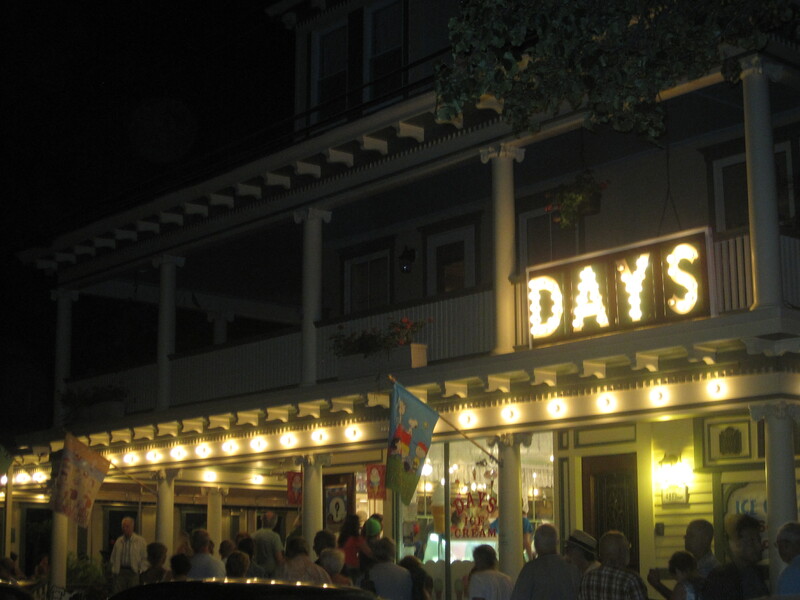 The atmosphere at Days is calming, nostalgic and cozy, much like the whole town, which feels as though Rodgers and Hammerstein were on the original planning board. Days was established in the late 1800s. It features bentwood chairs and gleaming dark wood tables. 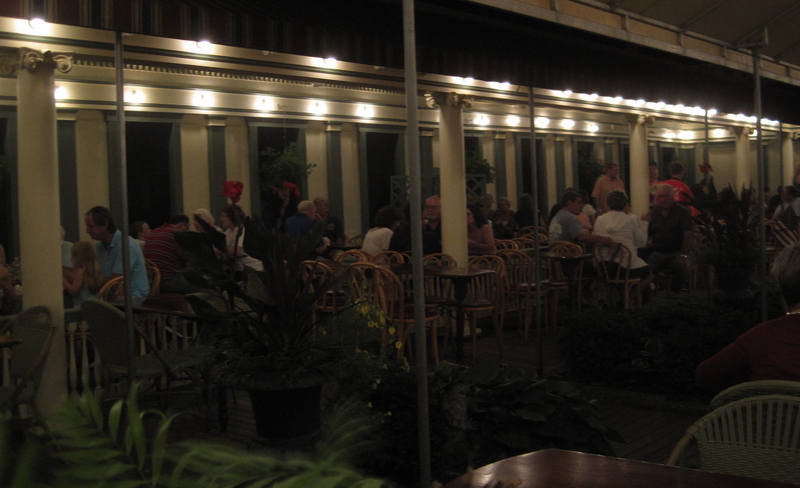 The seating area is outdoors, roofed in most areas, and its tall windows are always open to allow the ocean breezes as well as the ice cream to cool you. A antique fountain bubbles in the middle, among the plants. 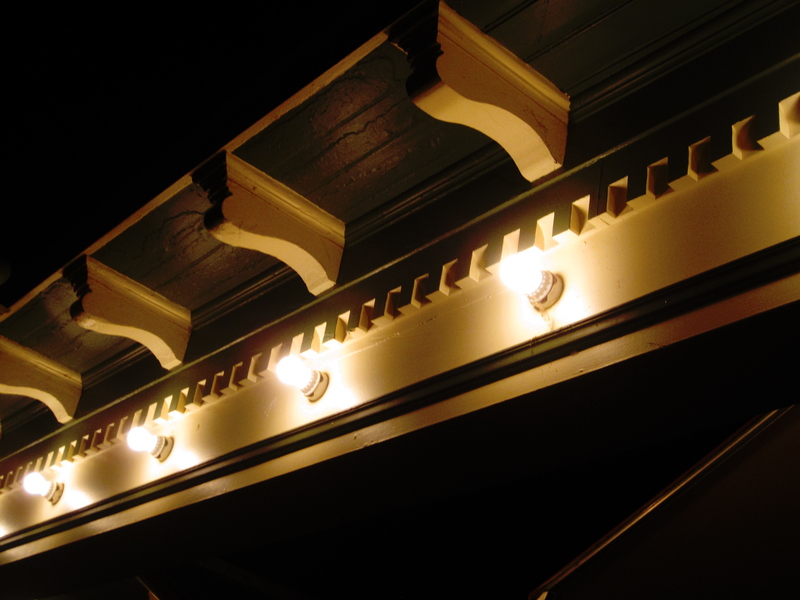 Forgoing harsh neon lights and signs, to this day, Days is happily, entirely illuminated by light bulbs. At night it glows like a giant birthday cake and smells as sweet. Once the sun goes down, locals and vacationers begin to amble over to stand in line—sun soaked, clad in loose faded t shirts, bikini tops, flip flops, hair freshly rinsed of salt water and slicked down, laughing, and very, very relaxed. Neighbors share adventures of the day with neighbors; newcomers chat with returning patrons about whose kids are starting kindergarten and about the virtues of Coppertone Babies lotion. Parents of the tiniest children hold them up to the glass counter to see the choices. Teenagers love chocolate chip mint cones and sundaes with piles of whipped cream. Older folks get dishes of their favorites from childhood. The proprietor tells me that on nights of the immensely popular Doo-Wop shows, whose audiences are Baby Boomers, he always puts out classics like rum raisin and pistachio and butter pecan. If all of this sounds like a page out of 1926, or out of Grimms’ Fairy Tales, it’s not. We’re all lucky that it’s not. And even better: we know we’re lucky. A vintage sign and scoop. I shot the below scene last Saturday night at around 10:30. Click on it to enlarge and see how many ages are represented. There’s something comforting about eating a timeless treat at a venue that’s older than all of us. For the past few years I’ve been partial to ice cream with a lot of stuff in it. Texture, lumps and bumps. 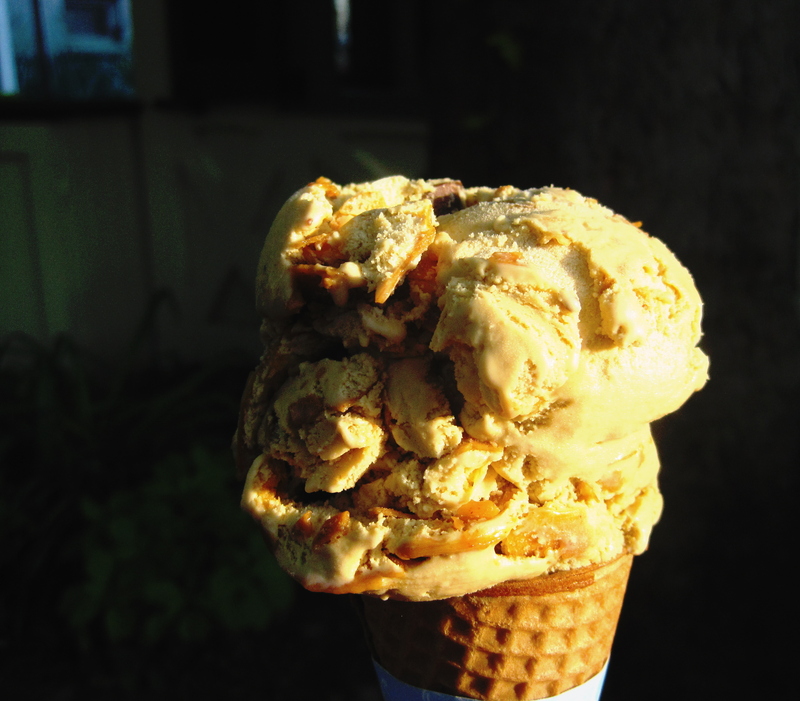 My current favorite, two years running, is the below—peanut butter moose tracks. Peanut butter ice cream with peanut butter ripples and chunks woven throughout, and studded here and there tiny peanut butter cups. In other words, my pipe dream. A new contender, chocolate midnight cookie, is vying for its place, though. No matter. Choosing a favorite ice cream is one of the happier dilemmas in life, I’d say. *Which is not to say that if someone offered it to me during the day that I’d fight them off with a stick. **The line you see in the photo was only half of it, by the way. If you go, go on the early side.